In 1938, when Henry Ford needed a more efficient carburetor for his new 24-stud Flathead V8 engine, he contracted development to the Chandler-Groves Company and the 94 two-barrel carburetor was born, fueling Ford engines until production ceased in 1953. Flash-forward to 2012 and the 94 is once again available, by none other than Edelbrock! Built around Edelbrock’s reputation of bolt-on performance carburetors, the Edelbrock 94 two-barrel carburetor provides nostalgic and period correct hot rods and restorations with the most accurate and best performing carburetor on the market. The Edelbrock 94 features a die-cast bowl and air horn with an aluminum 3-bolt base. 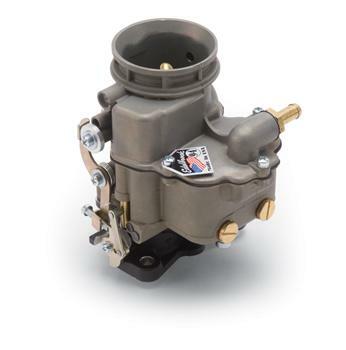 A secondary version of this carburetor is available and feaures no choke, making it a must have for multiple carb setups. They both feature an extended throttle shaft to make it easier to install dual and triple carburetor combinations, especially when used with Edelbrock’s exclusive progressive linkage. The throttle shaft has also been knurled to prevent the linkage arm from slipping. Extensive testing, both on the road and in our state-of-the-art engine dynamometer facility has allowed Edelbrock to offer a power valve and jetting combination that delivers a wide calibration band for smooth and strong performance in various applications.